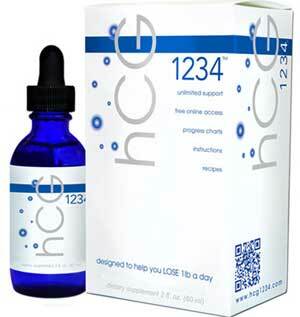 hCG 1234 weight loss drops are produced in the US by Creative Bioscience. They are designed to be used in conjunction with a very strict diet that provides just 1200 to 1500 calories each day and promises an average daily weight loss of 1.2 lbs. An average woman needs around 2000 calories each day to maintain her present weight, and an average man requires around 2500 calories per day, so dieters who sticks to any diet that provides a maximum of 1500 calories should see their fat melting away without the need for diet drops or supplements. The main ingredient is a proprietary blend that does not contain any human chorionic gonadotropin (HCG). The manufacturers are keen to guard their ingredient profile but also keen to point that the product does not contain any hormones natural or otherwise. HCG is a hormone that occurs naturally in the blood and urine of pregnant women and can also be produced by certain cancerous tumors. It became popular as a dieting aid in the 1950 when the British endocrinologist Albert T. W. Simons suggested it be taken in conjunction with an ultra-low-calorie weight-loss diet (less than 500 calories). He claimed its use could reduce the likelihood of muscle mass being lost along with fatty tissue, but this claim is far from being proven. The manufacturers state best results can be obtained by carrying out a 10 day lemonade detox prior to commencing the actual diet. The diet is split into 3 parts. 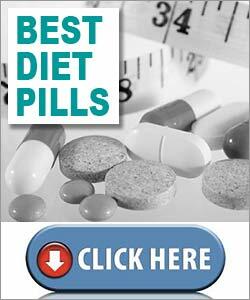 The diet drops are used during the first two phases only. PHASE 1 is a loading stage and dieters are advised to plenty of high fat foods to provide them with an additional fat reserve to use as a source energy during the (phase 2) dieting stage. The drops are taken three times each day. Each (10 drop) dose should be placed underneath the tongue, and held there for two minutes, half an hour before eating. Phase 1 lasts two days. PHASE 2 is where the real hard work begins. Dieters continue to use the drops, but must also stick to the supplied diet plans and limit their calorie intake to 12000 to 15000 per day. Dieters then have the option of sticking to the diet for three weeks (promised weight loss 15-20lbs.) or for 6 weeks (promised weight loss 34-40lbs). PHASE 3 will take a further 20 days. Sugar and starch must be avoided for three weeks, but the food intake may be increased at the rate of one item per day until the weight stabilizes. Daily weigh-ins are required and if the weight becomes more than 2lbs. higher than the lowest weight achieved a “steak day” comes into force. During a steak day the only drink allowed is water. Food must be avoided until the evening when a large steak is consumed for dinner. Later on in the evening one tomato or one apple may be eaten, but nothing more. Many past customers state hCG 1234 delivered the goods, but with so few calories allowed each day weight loss was inevitable anyway. The manufacturers state hCG 1234 is unsuitable for pregnant or nursing mothers, and warn that dieters who have known medical problems should get a doctor’s approval prior to using the drops. The only side effects mentioned on the product websites are dizziness and/or headaches, but HCG supplements are known to cause side effects that run the gamut from breathing difficulties and disorientation to rashes and stomach cramps. In most countries hCG 1234 can be purchased from select pharmacies and retail outlets. The drops are also available to buy online from Amazon and from the official hCG 1234 website. Customers who buy direct can expect to pay nearly $56 / £35 for a single (2oz.) bottle of drops. Amazon customers will secure a significant saving that can only be beaten by people who bulk buy from the hCG 1234 website and take advantage of the offered discounts available for larger orders (up to six bottles). There is 30 day money back guarantee, but customers must provide a “complete detailed 30-day journal of foods, drinks, cosmetics, and activities” before they can secure a refund. Diet drops are an extremely effective and not all brands are vague about their ingredients and willingness to blur the lines between hCG and natural. 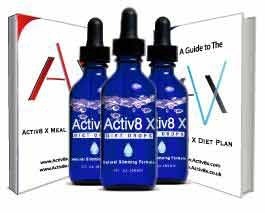 Activ8X is produced in the UK and contains several of todays most effective fat burning, appetite suppressing and crab blocking ingredients. It comes with the excellent AVX diet plan. Activ8X can also be used in conjunction with other diet supplements or slimming products. Activ8x is produced and distributed within the UK. It is a perfect example of how a company should operate with high emphasis on customer satisfaction. The product itself has been subject to many positive reviews. 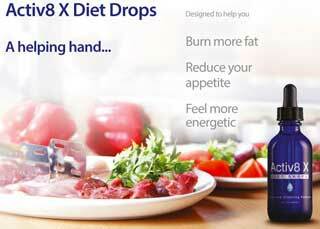 Diet drops have a reputation for getting to work faster than diet pills, so drops are becoming an increasingly popular weight loss option these days, and dieters who prefer drops to tablets or capsules have plenty of brands to choose from. Some are good, others are not so good. In this review we will take a look at Activ8X and see if the product is likely to be worth the hefty price tag (£49.99). Buying 3 bottles equates to £39.99 per bottle, with the includes AVX Diet Plan. There is also a 60 day money back guarantee. Customers are also provided with a complimentary diet plan and quick-start dieting guide. These usually come in PDF form, but customers who purchase three bottles on a single order also get physical copies of the books. Each bottle of Activ8X has a pipette fitted into the lid. This is used to deliver the drops, which should be placed under the tongue. A couple of minutes should be allowed before swallowing (diet drops are usually absorbed through the skin). Chromium: There is some indication that chromium may have appetite suppressing abilities, but its real value is as a fat burner. Grapefruit Powder: Used here to provide appetite suppression, but grapefruit can also help detoxify the body. Grape Seed Extract: Further study is required, but grape seed extract has a good reputation for assisting the fat burning process. Panax Ginseng: Great for boosting the immune system and improving the overall health. Recent studies suggest this Asian herb may also function as a carb blocker. Pyruvate: Believed to assist weight loss by converting sugars and starch into energy and providing a boost to the metabolism. Capsicum: Several studies prove capsicum’s value as a thermogenic fat burner and some researchers have noted metabolism changes that resulted in capsicum users burning calories at 12 times the normal speed. There are also indications that capsicum may be an appetite suppressant as well. Green Tea Leaf Extract: A popular inclusion in weight loss blends, green tea is rich in healthy antioxidants and has a proven ability as a thermogenic fat burner. Beta-alanine: A non-essential amino acid that can protect against loss of muscle mass (due to dieting). This appears to be a strong blend that should deliver some excellent results, but blend potential and can sometimes by ruined by substandard blending techniques so let’s take a look at some feedback and see if past customers have achieved the kind of benefits they should. The Activ8X website contains an impressive number of customer recommendations, all of which have been verified by a third party testimonial authentication service. Side effects are unlikely, but pregnant or nursing mothers should always consult a doctor prior to taking any form of dietary supplement. The same advice is offered to anyone who has known or suspected health issues or concerns. Activ8X is a recommended product. It may be pricey, but the blend contains a powerful mix of ingredients that should deliver the kind of weight loss results AMAS promises. Customer feedback is also very good and the guarantee is even better. Any company that is willing to allow a claim period of 200 days shows a lot of confidence in its product. We have confidence in Activ8X as well and do not believe it is likely that customers will need to ask AMAS to make good on their promised refund. Activ8X is manufactured in the UK by AMAS Enterprises Ltd, a subsidiary of the Anderson Mann Group Ltd. Although the company distributes product via a network of “approved retailers”, finding a local Activ8X stockist may be difficult so for most people it will probably be easiest to purchase some diet drops from the Activ8X website. It’s quick-loading, easy to navigate, and provides a generous amount of information about the product, along with several contact options for the customer services department. Each bottle of Activ8X contains a one-month supply of drops and customers are also granted access to the AVX website, so they can benefit from dieting tips and advice. At £49.99 per bottle, Activ8X does not come cheap, but AMAS promises a weight loss of 1 stone in the first month. If the product can deliver on that promise most customers may forgive the high price, and all purchases are protected by a 200 day money back guarantee, so there’s nothing to lose.